Here’s the result when a 20-pound living projectile hits your car while you’re traveling down a country road. I’m driving my family north on Route 7 towards Massachusetts a few miles south of Kent, CT, and I’d admiring the bucolic scenery. I notice off to the right just ahead what seems to be a large wild turkey. Then, it appears he’s moving. In fact, he’s taking off. Taking off into my lane. He’s on a direct intercept course with my car! I know there’s another car behind me, and I quickly check to confirm there’s no oncoming traffic. I start to veer into the opposite lane to try to avoid the flying beast. He keeps heading towards me. My car shudders with the direct hit. So I keep driving and stare ahead to ensure we stay on the road. I force myself again to take another peek at the impact zone. The window is intact and not cracked. But the side mirror has been destroyed and is hanging lifelessly on the side of the car by a lone, frayed white cable, blowing about in the wind. It would seem this absent-minded turkey hit the corner edge of my RAV4, and then tore off the side mirror as the car continued on forward. I finally find a safe spot to pull over and survey the situation more closely. And my sleeping son wakes up. He sees me holding and examining the shattered mirror and its fractured plastic housing. I think for a millisecond how to sanitize the incident for a four year old. He accepts my explanation and immediately suggests we get a new car. I strap myself back in, and we drive a short distance to a hardware store in Kent to get some duct tape and bubble wrap and then strap down the damaged parts until I can get it all repaired. The insurance appraiser quickly paid me a visit to talk turkey. 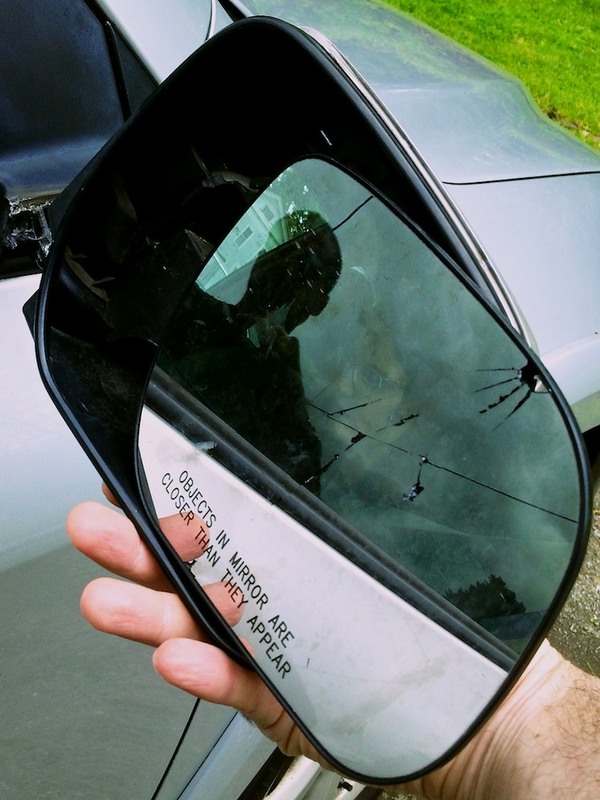 Last week, my mechanic replaced the mirror and buffed out the scratches on the car. And now, the only remaining remnant is one of those ‘funny’ stories burned into my memory. I just hope the rest of my summer isn’t quite as exciting!